Self-explanatory once again.. ha. Everyone and their mum does monarch manis, but I still like them. Wanted something nice and bright to offset the icky weather we've been having. I'm not totally satisfied, as usual, but it does satisfy my craving for bright spring nails. So freakin awesome I dont think I can stand it! Tutorial please! That is beautiful! I think I may give it a go one day, can you do us a tutorial? 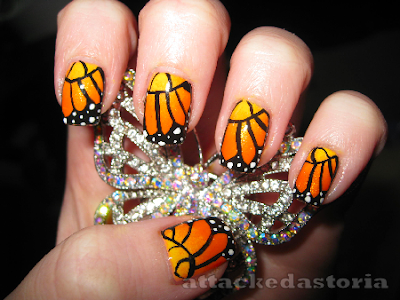 Aw, I've never heard of monarch manis, so I was thinking Venture Brothers lol. This is cool too though! Awesome! I tried to do these last night, hated my results and got rid of them within 5 minutes. I've done this mani here!